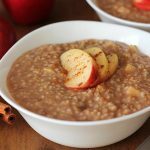 Apple Spice Instant Pot Steel Cut Oats that don’t require constant stirring or monitoring while cooking. Put all ingredients in your Instant Pot, set the timer, and walk away. When it’s done, you’ll have a hot, delicious, and filling breakfast! If you don’t have an Instant Pot, I’ve included directions on how to make this recipe on the stove top as well! I bought myself an Instant Pot in November (this is the one I bought! (Amazon Link)) and I’m in love with it. I’ve made quite a few things with it already (a lot of them are listed in this Instant Pot Vegan Recipes post and I have more recipes coming that I think you’ll like! ), but one recipe that was made over and over again during my recent holiday time off, is Apple Spice Instant Pot Steel Cut Oats. If you’ve ever made steel cut oats on the stove, you know that there’s constant stirring involved to avoid having it stick to the bottom of the pot and then most of the time, you need to add more liquids as it cooks because it can sometimes get too thick. Making steel cut oats on the stove top is fine and doable if it’s your only option, and I’ve included instructions on how to make it on the stove if you don’t have an Instant Pot. You aren’t going to get these steel cut oats in just 10 minutes. 10 minutes is the cooking time, BUT, the pot takes about 10 minutes to reach pressure, 10 minutes of cooking time, and then another 20 minutes to naturally come down from full pressure. It’s the same for all recipes you’ll make in your Instant Pot. Before you start any Instant Pot recipes, be sure to read the recipe thoroughly to get a good idea of the total time. There’s always time at the beginning to build pressure (this time varies based on how much is in the pot) and then time for it to de-pressurize (you can use the quick release method with other recipes, but I don’t recommend using it for this one). There are recipes that cook quicker than they would in the oven or on the stove top, even when the pressure build and release times are included, but I have not made any recipes like that yet. Soon! You throw your ingredients in, set the timer, and can walk away until it’s done. Once that lid is closed and you set the timer, you can leave and take care of other things that need to be taken care of. I’ve made pressure cooker steel cut oats several times over the past while and what I love about them (other than how easy they are to cook in the Instant Pot) is the taste. 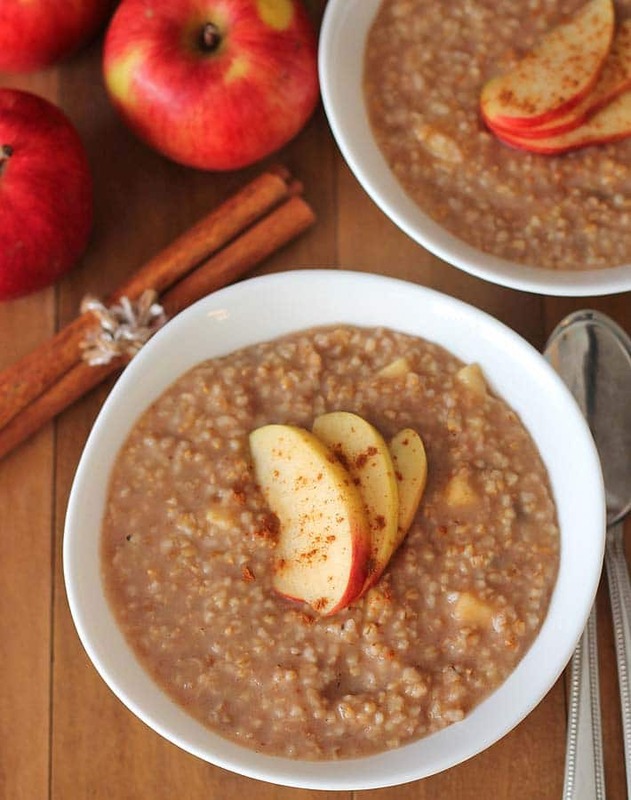 We are experiencing a really long stretch of very cold weather right now, and starting the day with hearty apple spice Instant Pot steel cut oats is very welcome…and nice! One thing you’ll notice about my recipe is that I don’t cook the apples with the oats. I like to leave a little “bite” to the apples. When added to the pot to cook with the oats, I find that they get a little too mushy for my liking. I also like to add raisins, but they’re optional because I know many of you don’t like them! Nuts or fresh apple slices are also a nice addition for garnish. When it comes to sweeteners, I don’t add any to this recipe, but that is my preference since I don’t like overly sweet breakfasts. I find that the apples and raisins sweeten it up enough, but if you like things sweeter, feel free to sweeten to a level that you like. Full details are in the recipe below. 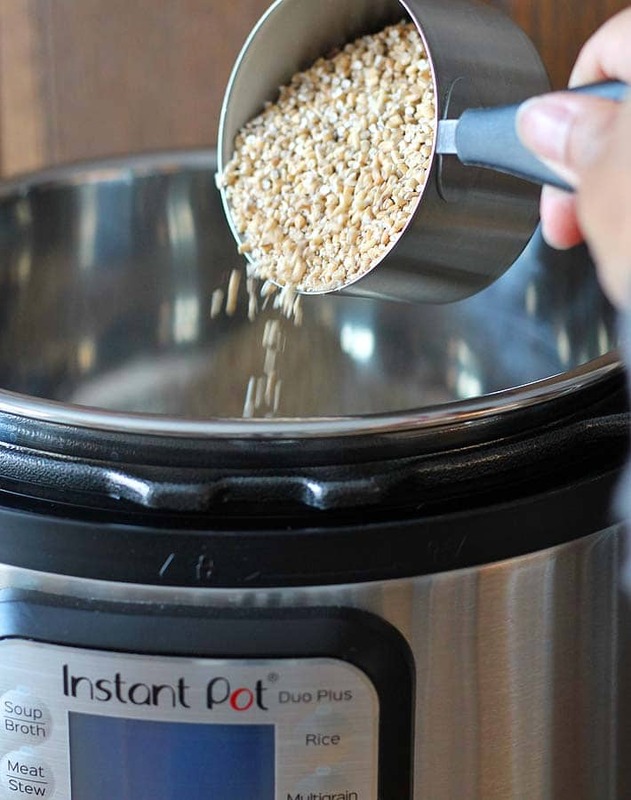 If you just bought your Instant Pot and you have questions, I recommend joining a few Instant Pot groups on Facebook. I’ve joined a few and I’ve been finding them helpful for tips and tricks as I get to know my new pressure cooker. It’s amazing what you can do with it! This is the official Instant Pot Facebook community, run by the Instant Pot company, and this is a vegan Instant Pot group where you’ll be able to find some recipe ideas. I don’t have an Instant pot, can I make this recipe on my stove top? Yes! You can. I’ve included instructions below on how to do it. And speaking of vegan Instant Pot recipes, be sure to check out my list of Easy Instant Pot Vegan Recipes, you’ll definitely find some ideas you’ll want to try! 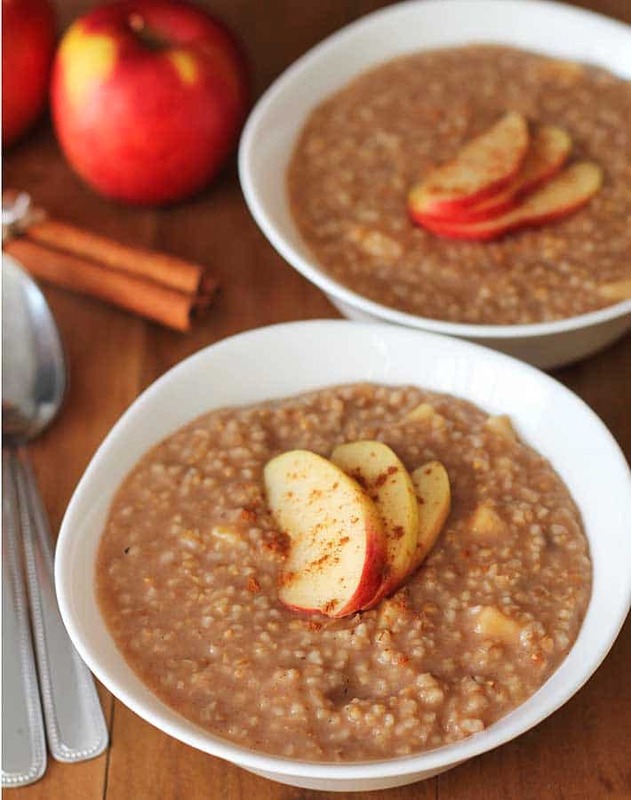 Do you have any other steel cut oats recipes other than apple spice? Yes! If apple spice isn’t your thing, check out these recipes for Banana Steel Cut Oats and Pumpkin Steel Cut Oats. If you make this recipe, let me know in the comments below, or share a pic with me on Instagram, I’m @delightfuladventures. 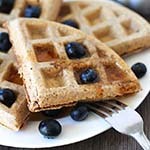 And click here for more delicious breakfast recipes! 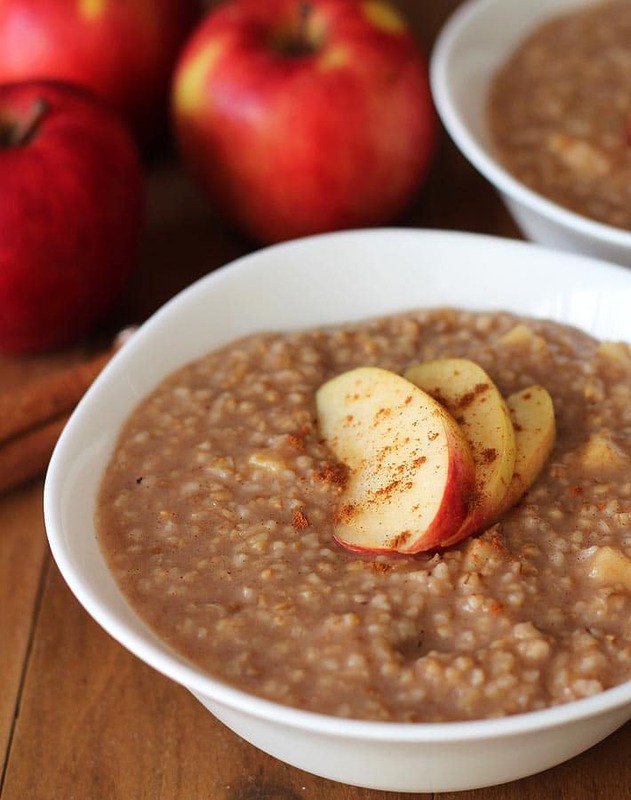 Hearty Apple Spice Instant Pot Steel Cut Oats make the perfect easy, warm, and delicious breakfast for cold days. Just throw the ingredients in, set it and your tasty oats will be ready in no time! Bring the 3 cups water to a boil. Once boiling, add salt and the steel cut oats. Reduce heat to medium-low. Cover and cook 15 - 25 minutes. Timing will depend on how soft you like your oats. Begin testing after 15 minutes. Stir often so oats do not stick to the bottom of the pot. In the last few minutes of cooking, add applesauce, cinnamon, and nutmeg. Stir well to combine. Once oats have reached the desired texture, remove from heat and let stand covered for a couple of minutes. This recipes makes 4.5 cups of apple spice Instant Pot oats, and can be split into two large servings, 3 medium servings, or 4 small servings. For safety reasons, I do not recommend doubling this recipe. Make separate batches, if needed. Nutrition info is for 1 serving (of 4) prepared without raisins, garnishes, and with no added milk. Click to learn how nutrition info is determined on this website. This is delicious! 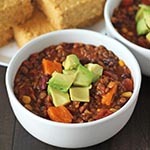 I’ve really come to love both my IP AND steel cut oats in the last few weeks, and this is my favorite kind of recipe! 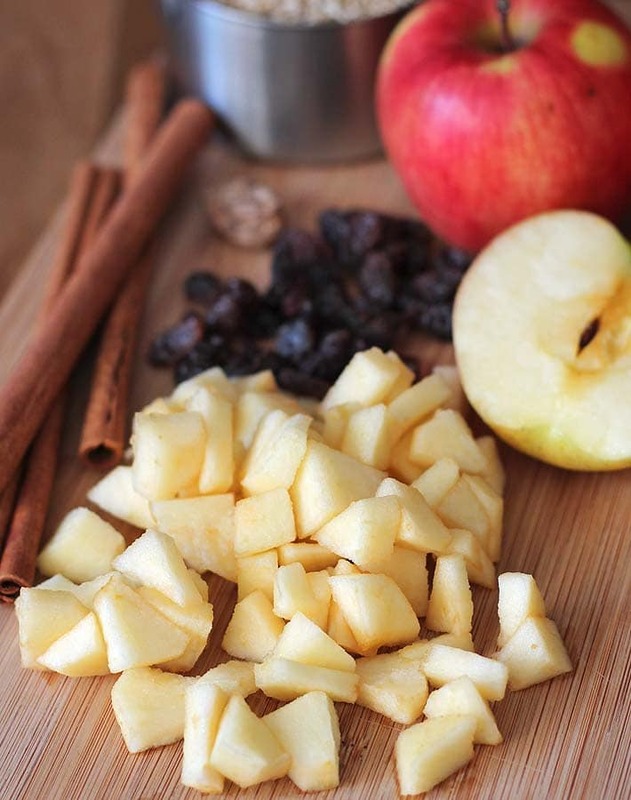 I like to grate my apples in and then add more diced bits on top for ultimate apple flavor! 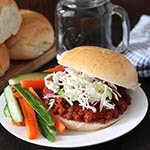 Love the addition of raisins too – so yummy! I made this for my breakfast today and loved it! The oats came out perfectly and at just the consistency I like and the texture was lovely with the apple and raisins added at the end. I’m looking forward to finishing up the leftovers. Thanks Gwen! Thank you so much, Mel! It’s an old stovetop favourite recipe but so much easier to make in the Instant Pot. Steel cut oats are back on the menu now 🙂 I’m so happy that you like the recipe! Thanks for your note.